It is possible to invite the visual system of a user to follow a pre-determined visual path on the screen. This can be achieved by placing focal points in a strategic manner. 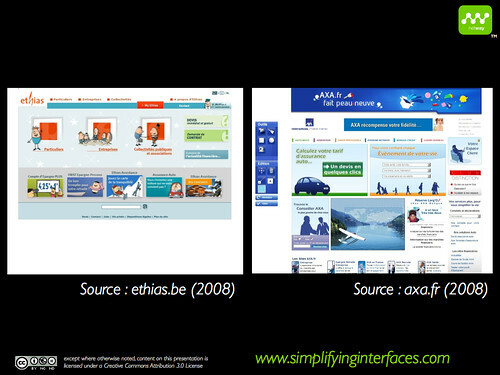 To illustrate my point, I will use two insurances sites: the Ethias site and the AXA site. Focal points are the places our eyes will visit, as commanded by the brain, in order to find information. The visual pathway is the sum of the focal points our eyes have visited. It allows our eyes to go from one focal point to the other. An expert can draw a visual path within a screen that 80% of users will follow in order to perform an identical task. The placement of focal points is thus a strategic issue. 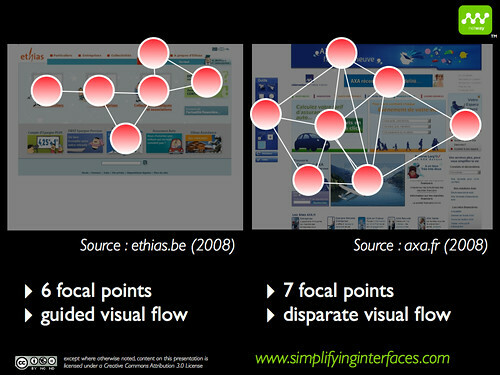 As our brain will choose 3 to 5 focal points within an interface to build the “Netway Neuro-Visual Landscape™”, it is important to help the user’s brain when it is choosing its focal points. Many forces come into play when a designer is designing a screen. Two forces are the fact we read from the left to the right, and from the top to the bottom. The other forces can be described using the Gestalt principles (I will come back to these in other posts). On the Ethias screen the focal points have been placed in order to generate a visual path that is for 80% predictable. We have of course tested these visual paths with real users when we were building user scenarios. The results of the site? Sales have multiplied by 5. Let’s now have a look at the AXA screen. 7 focal points, only one more than on the Ethias screen. However, the visual paths are disparate, and have not been controlled by the designer. For some techniques this means you put the Gestalt principles into practice. In the coming posts, I will talk about each Gestalt principle.